Tony is a graduate of the University of Cincinnati College of Law and also holds a MBA from Northern Kentucky University and a BBA in finance from University of Kentucky. He is the founder and Managing Attorney at Mahan Law where he spends the majority of his practice representing small businesses and individuals in all aspects of business law and civil litigation. In 2013, he and his wife, Dr. Jennifer Mahan, opened Riverview Animal Hospital in Bellevue, KY. Since that time, he has led the firm's DVO Division (Dentist, Veterinarians, and Optometrists) as general legal counsel. Tony has successfully represented clients before the State and Federal courts of Ohio, Kentucky, Indiana, and Florida, including successful appellate court rulings. 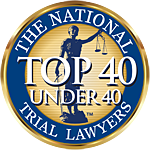 He is a 2014 and 2015 recipient of the National Trial Lawyers association’s “Top 40 Under 40” in Kentucky, which recognizes the top 40 trial lawyers from each state under the age of 40. Prior to engaging in his own law firm Tony worked as a law clerk to Justice Wil Schroeder on the Kentucky Supreme Court and worked as an associate commercial litigation attorney with a local law firm. Tony also serves as an adjunct professor of business law at Northern Kentucky University’s College of Business where he teaches Business Law and Emerging Enterprise Law to undergraduates and managerial legal concepts in the MBA department.